"Trees and shrubs are part of our nature." Make sure your property remains safe and accessible in any weather. McKinney Landscaping Corporation offers snow plowing and salting for commercial customers near Cortlandt Manor, New York. Winter storms don't wait for a convenient time to strike. That's why we at McKinney Landscaping Corporation are constantly monitoring the weather for changing forecasts, ensuring our crews are ready to go at any time. Your customers don't want to wade through snow drifts to reach their destination. Keep your entrances free and clear by hiring McKinney Landscaping Corporation. We plow and salt walkways in order to keep your home or business safe and accessible. 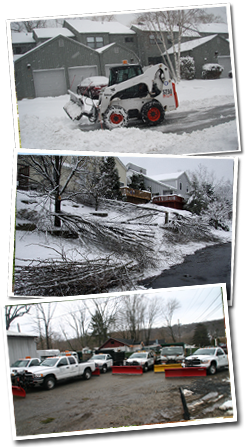 A powerful winter storm can damage trees and cause serious problems on your property. We clean up storm debris, remove dangerous trees, and make sure your property is safe.